First Choice for Users of Power Capacitors. Worldwide. ELECTRONICON is an innovative supplier of First-class heavy-current capacitors for manufacturers of power electronics and electrical engineering. Our components enable our customers to optimize their products for worldwide competition. Highly reliable and durable products „Made in Gera, Germany“ are our contribution to economical and sustainable growth. Over 75 years of experience in metallizing papers and films are as crucial to our success as the more than 80 years of experience in designing and manufacturing capacitors. Besides the cost advantages and extended quality control, our modern metallizing plant provides for higher flexibility and faster availability of materials than with the majority of our competitors. It is also the foundation of our very own know-how in metal coating techniques and distinguishes our products from all those depending on the expertise of external metallizers. Our highly versatile collection of winding machines is one of Europe's biggest, and a prerequisite of our huge product variety – matching the requirements of our markets. Manufacturing capacitors in Germany can be highly competitive - thanks to high productivity and automation in key departments. 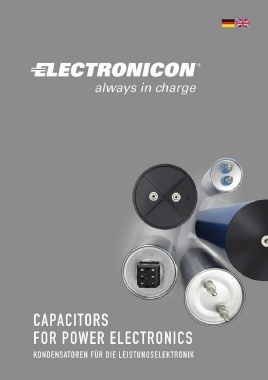 Our Vision: ELECTRONICON Capacitors – first choice for users all over the world.